Love is all around us. Whether it is a profound love for a higher being, a dedicated love to a spouse or partner, a tender love for children and family members, or a loyal love for friends, we all share in the splendors of love. We can feel a love for nature on witnessing a spectacular sunrise or a tear-inducing sunset. We can be stunned by love when we hold a newborn child in our arms. These 80 love poems span the centuries, from the earliest in 43 b.c.to the latest poems written only a few decades ago. Love is universal. All humans have felt love, have thrilled in it, have agonized in it, and have been moved by its power. By reading the love poetry from century to century, we realize just how universal this feeling is, and how powerful it can be. Love poetry can be perfect for love letters, for meditation, for wedding ceremonies, for reading on a sunny afternoon beneath a willow tree. I'm always eager to hear of new love poems to add to this collection. If you have a favorite poet, please let me know! 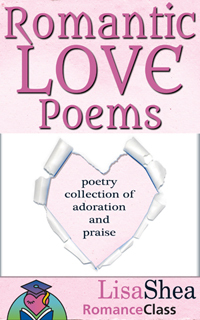 Enjoy this treasury of love poems!